The Sketchbook Project often has some cool challenges to participate in and Songs to Draw From is the latest one I’ve taken part in. I really liked the concept of the challenge; you find a song you’re inspired by and create a 4×6 inch illustration. I love the idea of paintings having a soundtrack and it’s something I’ve talked to other artists about as well. It’s not uncommon for me to choose a song and listen to that song on repeat until a work is finished. 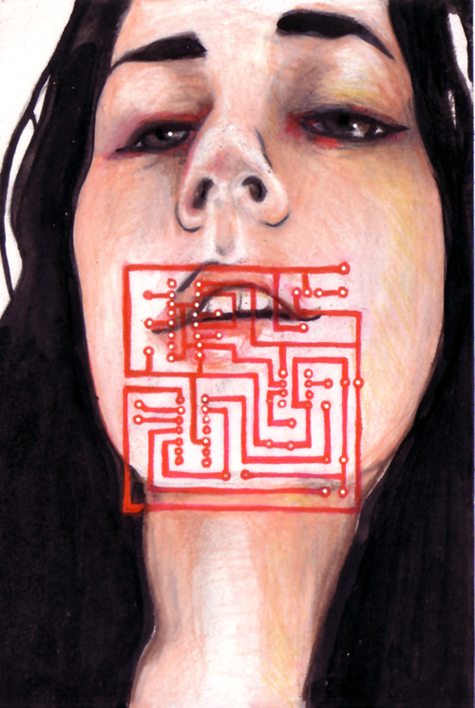 Prismacolor pencil and india ink, 4 inches by 6 inches. This still doesn’t seem like a lot to me, but I’m still working. I’m really going to miss summer school when it’s over. Okay… I don’t think I’ve updated my website since 2006…. but HERE WE GO! It’s gonna take me a bit yet. Still can’t figure this theme out and my domain/hosting isn’t set up, but I’m working on it. woot.